I am originally from Ecuador, South America. I moved to the USA 33 years ago. I lived in New Jersey for a few years, but being from the warm areas of Ecuador, New Jersey was too cold for me so I moved to the Sunshine State. I graduated from Erwin Technical College as a massage therapist in 1997. It has been over 21 years since then and I am as passionate about my career now as I was when I started. I have the experience and the training to provide the quality of therapeutic massage that you deserve. My desire is to help people to feel better. That is why my goal has always been to keep my training up to date by taking new classes, seminars and workshops with the best institutions so I can give you the most effective therapy possible. This has enabled me to address any issues, whether it is accident/injury related or just relaxation. A few years ago I went back to school and obtained my license as an Esthetician. Since then I have dedicated myself to becoming highly skilled in skin analysis, diagnosis, and treatment so I can give you the best service as an esthetician. For this reason I have also decided to use one of the best skin products on the market, PCA Skin. My goal is to correct and achieve great results no matter whether the problem is acne, hyper-pigmentation, sensitive skin, or any other problem that you may encounter. Also, my ability to combine massage and facial services in one session gives you the opportunity to enjoy the pampering experience that you deserve. Allow me to use my expertise to provide you with caring, nurturing, and most of all the therapeutic benefits of massage and facials. 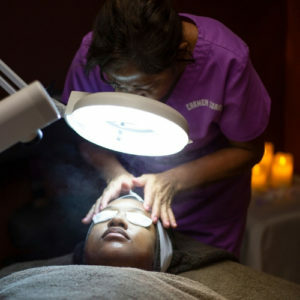 I will customize each massage or facial to give you the pampering or healing effect that you desire. And, as always, a one hour massage is a full 60 minutes long.